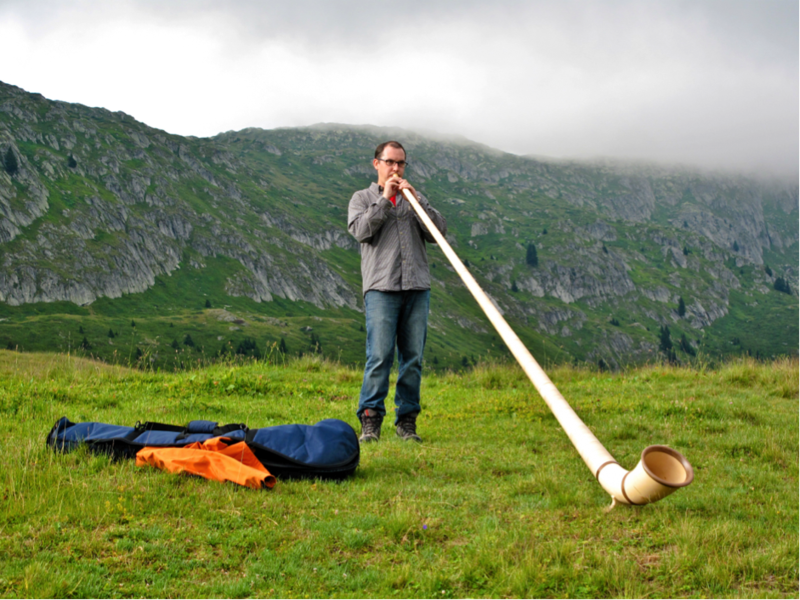 Yodelers, it’s that time of year again—time for alphorn camp, that is. So stop putting off learning the Swiss national instrument and start spending your first weekend in July attending Fritz Frautschi’s short beginner’s alphorn class in the most appropriately named alphorn-learning location in Switzerland—the Horn Mountain. Not far from Gstaad, the Hornberg is your stage, the cows are your audience, and the Hotel Restaurant Hornfluh is your après-horn, serving you that well-earned drink after a hard day of practice. Fritz Frautschi founded the Swiss Alphorn School over twenty years ago and offers courses in the Bernese Oberland. He credits the popularity of his alphorn classes with people’s desire to get back to nature. Unfortunately, learning to blow one of the world’s largest wind instruments isn’t so natural. The alphorn is 3.5 meters long and has no finger holes, tubes, or valves, so all note variations are controlled by the speed and force of your lip vibrations on the mouthpiece. According to one student, the more you kiss your spouse, the easier blowing the alphorn becomes. It’s much easier to learn the alphorn if you’ve previously played an instrument like the tuba or trumpet. But regardless of your musical experience, Frautschi prioritizes teaching you how to make a lovely sound—which is great, because a beginner playing the alphorn often produces a sound that resembles a dying cow. Speaking of cows, the alphorn attracts them. Play a few notes (good or bad) and cattle come calling. The alphorn is how the farmers bring their herds home and how you, the non-farmer, can entice an unintentional but very committed audience. Tourists may flock to you as well. And if The Frau’s experience counts for anything, you don’t have to be a master player to get a following. As well as attracting cows and tourists, the alphorn also inspires Swiss conversation. The instrument’s history may have a lot to do with this; besides bringing the cows home, the alphorn was also used to communicate with fellow herdsmen across many valleys. The Frau once called the alphorn “Switzerland’s secret social networking tool” because all the normal cultural formalities that apply in Switzerland are set aside if you carry an alphorn. Fellow alphorn players, strangers or not, are always on first-name terms with each other. So if you’ve always wanted to get to know a particular Swiss person better, now you know what to do. Come home from alphorn camp and play the Swiss national instrument on a city street, and you will have discovered the key to Swiss culture (and perhaps a nice source of income). Weekend Alphorn Course on Horn Mountain: June 30-July 2, 2017. P.S. 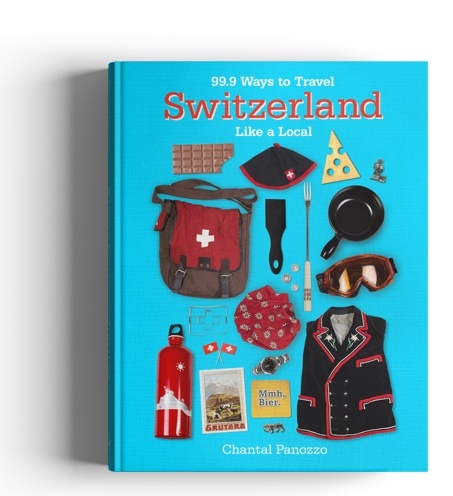 You can enjoy 98.9 more ideas like this in The Frau’s new Swiss travel book, 99.9 Ways to Travel Switzerland Like a Local. :o Alphorn? It's so huge! It must be a great experience. my husband has been out of the house for the past 2 months with out saying a word to me nor my kids though i have been worried and i felt something bad had happen to him so i contacted his friends for solution and they said they dont know about his were about so i went on line through the help of a fwend so i contacted jeajamhacker@gmail.com to help me hack into my husband phone so we can track his phone but to my greatest surprised this my so called husband had been in a hotel with a female for 2 months i got to see his whats-app messages,text messages,call logs,Facebook,deleted text messages and many more then i knew my husband was a beast well thanks to jeajamhacker@gmail.com his services are fast,reliable and affordable.